What Kind of Dance Student Are You? With the help of our awesome Crystal Ballroom Teachers, becoming a skilled social dancer is easy and fun. Becoming a social dancer is life changing. Just imagine how terrific it would feel to go out dancing every weekend. All of a sudden new doors open with new possibilities and getting out and being social feels good again. Getting in shape starts to feel natural and easy. 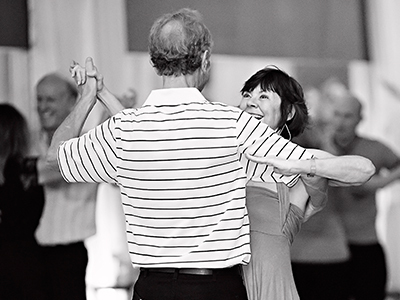 Our Crystal Ballroom dance instructors can take you out dancing every single weekend. Just check out our dancing calendar and see all the dance party possibilities. Schedule your lesson now, click here! This style of dancer has far exceeded the requirements needed to be a social dancer. The hobbyist takes dancing to the next level, wearing dramatic dance costumes and participating in performances as well as competitions. These dancers are all ages and all levels. These dancers are fit, fun, energetic and live for the applause. Click here to see a pro – am (student & teacher) performance. Not sure which dance package is right for you? Take our quiz to find out! Have fun with the “Piggy Back Method”, it will give you the best bang for your buck in every way. Take a private lesson on Wednesday night at 6:45ish and then dance with your Pro – Party Partner(your Teacher) at the Crystal Ballroom Wednesday Hump Day Party(about 50 other dancers). Take a fun group class at 7:15 on Friday night(about 20 other dancers) and then dance with your Pro-Party Partner at the Friday Night Ballroom Dance Extravaganza(about 80 other dancers)! The “Wonderful Wednesday Dancer” package is designed for a busy person. Not everyone has several nights a week free to go out dancing and socialize. Combining your lesson with a party on the same night is a great way to learn and have fun for people who have a “time budget”, not a lot to spare. Take about 5 private lessons with a professional ballroom dancing instructor and work on the basics of about 3-5 dances. Get comfy with a spin or two and the rhythms of each dance. Get some working knowledge on leading or following so you are aware of the techniques. Let your PRO-PARTY PARTNER (your teacher) take you out dancing on Wednesday night, Friday night, Saturday night and possibly Sunday if you can still stand. The “Crash Course Intro Package” teaching method embraces the timeless wisdom: “If you don’t use it you lose it”. This package is great for beginners because it exposes them immediately to all the amazing people that are at the weekend dancing extravaganzas! See the scene so you can decide if you want to be on the scene. Do the Free group lessons that are offered before the parties. You will start to meet a lot of other like-minded people who are ready to have a great time on a Friday or Saturday night. The “Do Dance Daily” package could finally be the right answer to the timeless struggle of staying in shape. Even if you do half of the recommended activity in the “Do Dance Daily” package you will still see results. Additionally, in only 1 month you would become an awesome dancer. It is common to see significant weight loss in beginner students who made a decision to use dance as a tool to lose weight. Eat right, dance at night, win the fight, Become a dancer! The “Dancesport Competitor Package” is designed for beginners. Our teaching styles are tried and true and will transform ANY inexperienced “dancer wannabe” into an amazing dancer! 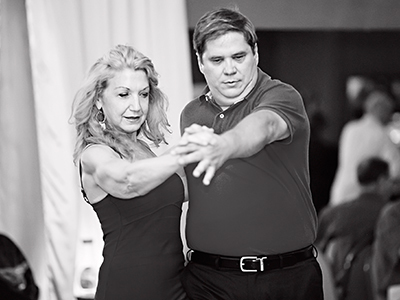 Your Ballroom Instructor will submerse you in the world of ballroom dancing. He or she will mentor you on all of the trade secrets and tricks in the industry. Topics like: shoes, costumes, jewelry, hair, competitions, music, and so much more!